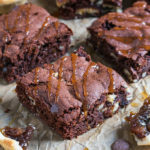 These thick and chewy chocolate brownies are stuffed with mince pies and make the most amazing festive treat. A twist on a classic brownie, these beauties are easy to make and addictive! Preheat the oven to 180C/350F and spray an 8x8 inch square pan with cooking spray. Lay a strip of grease proof paper across the pan one way, with overhang at each end to help you lift the brownies out. Place the butter and dark chocolate into a heat proof bowl and microwave in 20 second increments, stirring in between, until the chocolate and butter are all melted together. Leave to one side. Place the sugars, eggs and vanilla extract into a large bowl and whisk until combined and slightly frothy. Pour the chocolate mixture into the egg mixture and whisk briefly to combine. Add in the flour, cocoa powder, mixed spice and baking powder and whisk until everything comes together and there are no lumps of four. Tip in the crushed mince pies and fold in gently with a spoon. Pour the brownie mixture into your prepared pan and spread into an even layer. Place in the oven for 25-30 minutes, until the top looks matte in the oven light and an inserted skewer into the centre comes out with a few crumbs on, not liquid mixture. A skewer into the edges should come out clean. Leave the brownies to cool completely in the pan before transferring to a chopping board and slicing into 9-12 squares. Mince Pie Brownies will keep in an airtight container, at room temperature, for 5 days.